Sitting Figure. 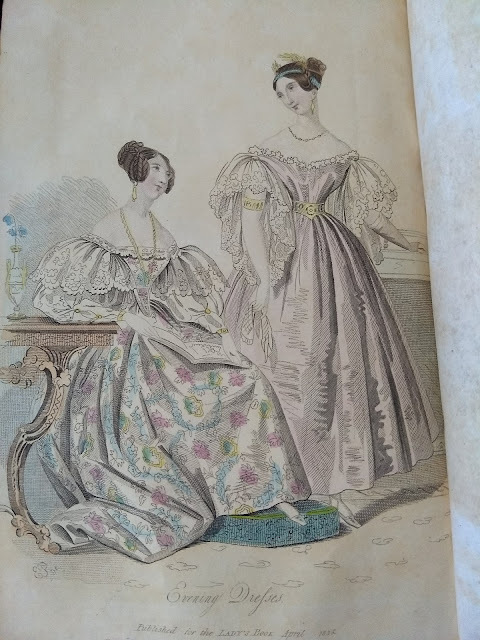 -- A printed satin robe, white ground, and pattern in vivid colours of small sprigs in winding columns, and large single flowers in compartments. The corsage is cut very low and square on the back and front of the bust, but rather higher on the shoulder than they are generally made; it sits close to the shape, terminates in a peak before, and is trimmed with a single row of narrow blond lace laid on flat. Blond lace long sleeves of the usual size at the top, and moderately full from the elbow to the wrist; they are made open from the bend of the arm, but are attached in three places by gold filigree buttons, and surmounted by mancherons* of broad blond lace. The hair parted on the forehead, is arranged on each side in a plaited band, which is doubled and hangs low. The hind-hair, also arranged in a braid, is twined round the summit of the head. Gold ear-rings, neck chain, and bracelets. White kid gloves; white satin slippers. Standing Figure. -- The robe is pale rose-coloured mousseline de soie over gros de Naples to correspond. A low corsage sitting close to the shape at the upper part, but with a little fulness at the bottom of the waist; it is trimmed round the bust with a blond lace ruche. Short under sleeve of white gros de Naples, with one of blond lace of the Marino Faliero form† over it; a part of the fulness of the latter is confined by a gold agraffe* on the shoulder. Armlets and ceinture* of gold net, with gold clasps. The hair is parted on the forehead and turned up behind; the ends form a cluster of curls. A band of fancy jewelry and bunches of gold wheat complete the coiffure. Necklace and ear-rings gold and nicolos. * White silk net gloves. White gros de Naples slippers of the sandal form. † The original Marino Faliero was elected Doge of Venice in 1354 and tried to stage a coup against the city's aristocrats; he failed and was executed in 1355. Lord Byron published a blank-verse play about him in 1821, which inspired Casimir Delavigne to write another version in 1829 and Eugène Delacroix to paint the execution in 1825-26. The coup was also turned into an opera by Gaetano Donizetti, and it was first performed in Paris in March 1835. It's most likely that a character in it wore sleeves cut like this, and so the name was attached to the shape. John Rogers Herbert also painted scenes from the story in the late 1830s, possibly based off of the opera's costuming; this painting depicts Faliero's wife in sleeves that are shorter on top and longer underneath. Thanks for sharing your fashion plates, and explaining them too! I got curious about the 'nicolos', and did some digging - nicolo is a kind of blueish intaglio, popular in Roman times. Thanks so much! That's very helpful.